With the world around us changing at an alarming pace, there are few things that seem to stay resolute through time. You’d think that wedding traditions would be rather steadfast, right? After all, even in 2018, we’re still following the age-old traditions: something old, something new, something borrowed, something blue. White dresses and a ring on the left hand…but are wedding trends really so rigid? Join antique jewellery supplier AC Silver, as we hop back in time to look at how weddings have evolved over time. 1910s — Loose-fitting, long dresses were key here, as dancing became a trend and required the bride to be able to move around! 1920s — Of course, the flapper style of this era threaded into wedding dresses too. High scoop necklines and low waists were prevalent here, matched with a veil. Interestingly, the veil dates back to Ancient Greece and Rome, and was intended to confuse demons and evil spirits who might wish to harm the bride-to-be. 1930s — Rayon and, for those who could afford it, silk became the trend in the 30s. The dresses were slim and figure-hugging, with a high neckline and long sleeves. Some brides also opted for a dress they could dye and wear again after the wedding. 1940s — Wedding dress trends didn’t change all that much, with the 40s still favouring sleeves and streamlined dresses. Often, the dresses were created with furnishing fabrics and lace curtains due to the hardships of wartime. 1950s — Perhaps in celebration of the end of the war, wedding dresses became far more extravagant. 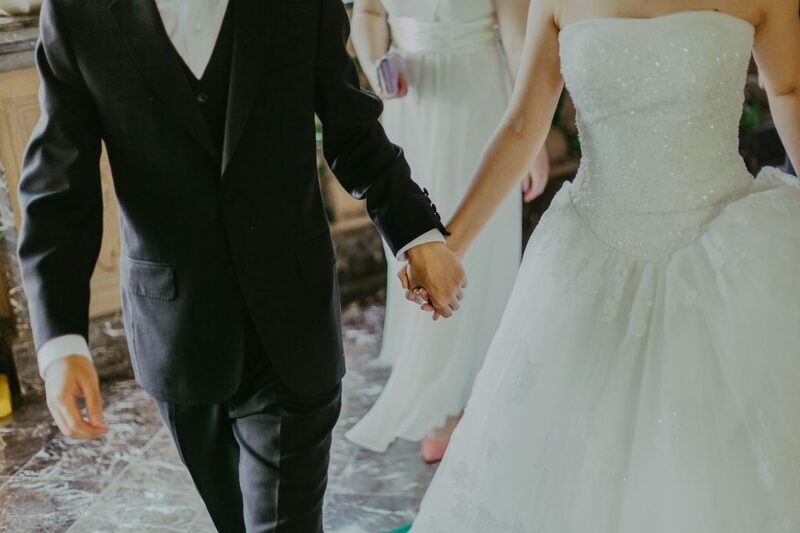 Ball-gown silhouettes, long opera-style gloves, and sweetheart necklines were all the rage, with some brides even opting for a more risqué strapless look. 1960s — Quickly tired of the flouncy, large skirts of ballgowns, the 60s saw a swift return to the slim-fit dress and sleeves. For some brides, the skirts got a little shorter in the wake of the mini-skirt trend of the decade. 1970s — High-necks were back, along with sleeves that go bigger and sported a puff at the elbow. 1980s — After this surge of highlighting sleeves, the 80s saw sleeves disappear altogether. Strapless dresses were everywhere in weddings during this decade. Slim fits with a delicate puffy shoulder were also adored. 1990s — The trend shifted back to sleeves quickly, with short and long sleeves both featuring across many Big Days. 2000s — Diversity became key in this decade, with a whole array of options from slim fit to flowing gowns. Embroidery was a key trend, as well as another foray into strapless designs. 2010s — Again, the strapless trend wasn’t to last! Sleeves have made a comeback in the wake of Kate Middleton’s wedding dress, along with see-through detailing. The emphasis on personal taste over trend is very much the norm, with everything from slim fits to voluminous skirts on show. With trends changing so much, it’s strange that the colour of the dress hasn’t moved much in a century. Well, the white dress is attributed to a single wedding in 1840 — the wedding of Queen Victoria and Prince Albert. The Queen chose a white lace and silk dress of her own design, and at the time, it was a shocking move. The colour white was linked to mourning at the time, so it seemed a very strange choice for a wedding dress. But it would be an understatement to say the trend caught on, with wedding dresses 178 years later still predominantly being white. In fact, some even went as far as to say white should have been the choice of a bride all along, with connotations of purity and innocence held to the shade rather than that of mourning. Another staple tradition of the wedding is, of course, the ring. It is said that the ring is placed on the fourth finger of our left hands, as it was once thought that there was a vein leading from that finger directly to the heart. However, it turns out this lovely sentiment is rooted in myth. In truth, the exchange of rings traces back to early Roman and Greek eras, where the ring was used to ‘pay’ the father of the bride. The use of men’s wedding rings has a much more sentimental origin though. In the 1940s, wedding rings for men became popular as a way to visually connect the couple during times of separation. According to various sources, many wedding traditions had one purpose originally: to ward off evil spirits that might try to harm the bride. From the previously mentioned veil intended to confuse wicked spirits, to carrying the bride over the threshold, even the choice of flowers in the bouquet were all intended to keep evil spirits away. Will you be keeping these wedding traditions on your Big Day? Maybe you have some family-specific traditions you need to uphold?